So...what exactly is the stamped overlay system? The stamped overlay system yields a surface that not only permanently bonds to the substrate, but is resistant to most chemicals, salt, water, bacteria, algae, and dirt. In addition the stamp overlay system surfaces are more durable than concrete, easier to keep clean, color fast, and is usually a fraction of teh installed cost of the material it replicates! Why consider using the overlay system for your project? 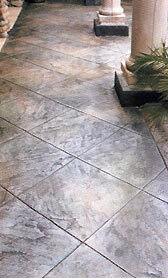 The stamped overlay system is engineered to industry standard in polymer enhanced cemetitious material. Each component within the system is designed expressly to work together as a complete unit. The end result is an extremely durable coating that becomes an integral part of the concrete surface both chemically and mechanically. The properties of the polymer resins and sealers used in the stamped overlay system yields surface that is highly resistant to most stains, chemicals, salts funguses and UV deterioration. Furthermore, the polymer resins add and element of flexibility which allows the overlay material to move somewhat with the concrete substrate, substantially decreasing the chances of delaminations in extreme climates. The stamped overlay system is very serviceable, with regular cleaning with a hose and a broom, the finished product will look great for years. 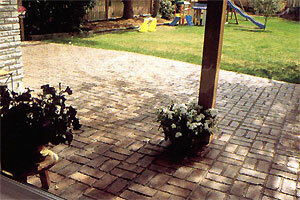 An occasional coat of sealer is all that is required to keep your project looking new. In most cases, the overlay system is a very cost effective alternative to slate, fieldstone, marble, tile, brick, wood terrazzo, or most any other interior or exterior flooring.